By using XJTAG for board testing and component programming, railway communications expert CAF Power & Automation avoids the overheads involved with using multiple sets of equipment and can ensure that each board will function correctly. The company’s assembly partners are also using XJTAG, which enables consistent and efficient interactions throughout development and production. The company is using XJTAG boundary scan to test the circuit boards used in the ITS modules, which are deployed in office-based, trackside and train-mounted locations. “Testing with XJTAG helps us guarantee high product reliability for our customers”, says Javier Gordo, Manufacturing Manager. XJTAG is used in development, to verify designs and debug prototype boards, as well as for independent checking of production boards delivered by external assembly partners. The assembly partners, also, are testing with XJTAG. “The system is easy to use, and has allowed us to establish a consistent boundary scan environment from prototype to production. This enables seamless interactions between internal engineering activities and external assemblers, and we are able to re-use successful tests across any of these activities”, adds Javier Gordo. XJTAG achieves high test coverage by testing not only the JTAG-compliant devices but also non-JTAG devices on nets connected to the boundary scan chain. In addition, automated Design For Test (DFT) analysis helps maximise test coverage, while XJTAG’s unique high-level test description language XJEase simplifies testing of non-JTAG devices. XJEase enables engineers to create tests by specifying input pin levels and expected outputs; the system then calculates how to generate and apply the required test patterns. This device-centric approach allows tests for individual devices to be retained and used in subsequent projects. An online library of XJEase tests for commonly used devices is available at www.xjtag.com. CAF Power & Automation is also taking advantage of XJTAG’s device programming capabilities. The XJDeveloper graphical application can run SVF and STAPL files to program devices such as microcontrollers, PLDs and non-volatile memories in situ after the board is assembled. Alternatively, XJEase scripts can be written to program an image directly. XJTAG also has unique capabilities to speed up programming of Flash devices. Testing with XJTAG helps us guarantee high product reliability for our customers. The system is easy to use, and has allowed us to establish a consistent boundary scan environment from prototype to production, benefiting from seamless interactions between internal engineering activities and external assemblers. Consolidating test and programming activities onto one instrument saves the overheads involved with using multiple items of equipment, and also eliminates opportunities for errors such as incorrectly programmed devices. Buying XJTAG provides immediate access to all the system’s features, whereas some competing systems force customers to pay extra for capabilities they need. CAF Power & Automation is a member of CAF Group, an international market leader in equipment and components for railway systems. 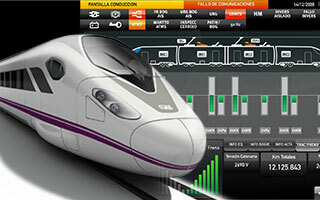 Based in San Sebastián, northern Spain, the company is dedicated to developing Intelligent Transport Systems (ITS) that maximise the effectiveness, efficiency and safety of rail transportation networks. To serve its worldwide customer base, which includes government agencies and private contractors, CAF must deliver advanced product capabilities combined with extremely high quality and value.